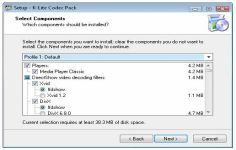 K-Lite Codec Pack is a complete package of codecs developed for users that want to play all the popular audio and video formats. K-Lite Codec Pack is a codec necessary to view a video or listen to music on a PC. This codec pack contains everything needed to play the files to the most popular audio and video formats: DivX Pro, Xvid, Windows Media, AC3, anti-freeze Divx, 3ivX, Cyberlink DVD decoder, Ligos MPEG-2 decoder decoder Elecard MPEG-2, Intel Indeo, Ogg Vorbis, DirectVobSub, Morgan Multimedia Stream Switcher, FourCC Code Changer, etc. K- Lite Codec Pack has great adaptation, containing DirectShow filters VFW / ACM needed for encoding and decoding operations. With this software, user can view all the audio and video files, even with very rare formats. The applicationâ€™s new components are updated continuously after being tested by the publisher. Before the procedure update K- Lite Codec Pack checks if there is similar codecs already installed on the computer in order to avoid conflict. The application offers also the possibility to put subtitles to the movies. K -Lite Codec Pack has a number of additional tools, easily manipulated by the home menu. This will help to perform multiple tasks .